Eddie Perez caught 832 1/3 innings from Maddux, by far the most of any catcher, all with the Atlanta Braves. 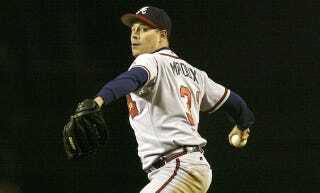 He caught Maddux's final Cy Young season, which capped a four-year era in which Maddux was 75-29 with a 1.98 ERA. His strikeout-to-walk ratio was 7. And early on, when Perez was learning the big-league game, Maddux called nearly every pitch from the mound. "Now I can talk about it," Perez said Tuesday. When Perez returned the ball to the mound, he said, Maddux would designate the next pitch by the way he caught the ball, or the way he held his right hand, or touched his cap. And Perez would follow along. It went on like that for months, until Perez decided he knew the opposing hitters – and Maddux – well enough to take over. "I got it," he told Maddux one afternoon. "Let me call tonight's game." Maddux nodded and went along with it, shaking off Perez only two or three times. They won the game. Perez was elated. "How'd I do?" Perez asked proudly. Maddux looked up at Perez and said, "Those two or three? That's too much." Seriously, we can never have too many stories like this about Greg Maddux. Every baseball story should just be a story about Greg Maddux, like this one. More Greg Maddux.